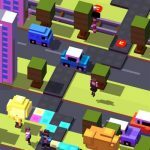 Regardless of whether you own an iPhone, iPad or Android phone or tablet, you can play Crossy Road – Endless Arcade Hopper, a quirky action game from Hipster Whale. The company doesn’t go straight to the point in Crossy Road’s promotional blurb, instead asking a series of rhetorical questions. However, as you’ll find out later on in the description, the game gives you a chance to “dodge traffic in a candy wonderland” and “cross roads, train tracks, and rivers” in an endless, yet casual hop in a colorful in-game world. So how can you get a high score in Crossy Road? 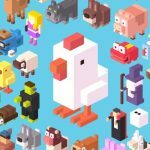 Read on, as we’ve got some helpful Crossy Road cheats, tips and hints for you. 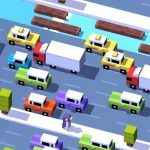 The premise of Crossy Road is very similar to Frogger, in the sense that it’s important to focus on your character, but even more important to pay attention to the hazards you’ll be encountering. We advise playing in Landscape Mode, and properly measuring your moves before executing them. This should be very simple – when controlling your character, it’s best to tap right behind it, instead of tapping in front; doing the latter isn’t very smart, as that will block your point of view and make it hard to plan ahead of obstacles. We can’t help it, and it happens even to the best of us. But if you accidentally tap on your display, you can hold your finger down on the screen for a few seconds, so that your character stays put instead of jumping forward by accident. It can be a chore to cross several roads with a good number of vehicles in your way. But you can get ahead of the curve, so to say, by timing your jumps just as vehicles pass your way. This would give you better odds of moving on to the next lane, as you’ll be nearer to a vehicle’s bumper, and also help you regain your focus ahead of your next move. You may want to take a conservative approach to things and “camp out” in the same spot where you’re at. This is an absolute no-no – yes, it’s good to play it safe at times, but stay too long in one spot and you’ll be encountering that nasty eagle, and that’s something you don’t want happening. The only way to go in Crossy Road is forward. If you see blue and red lights by the side of your device’s display, that means the cops are coming, and that means you should move out the way as fast as possible. 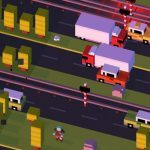 Players who practice Crossy Roads regularly are rewarded by getting better and more comfortable. So if you’re really into this game, we suggest playing it about a half-hour to an hour or two, but not too much, as you don’t want your game to suffer because you’ve been playing it for far too long.